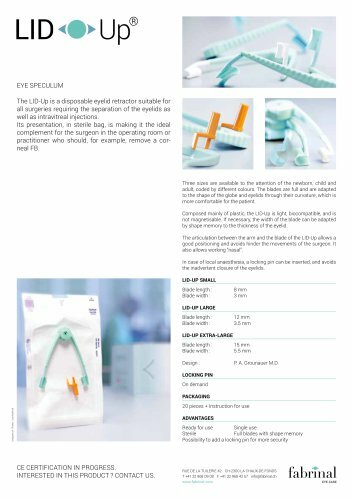 EYE SPECULUM The LID-Up is a disposable retractor-31262.html">eyelid retractor suitable for all surgeries requiring the separation of the eyelids as well as intravitreal injections. Its presentation, in sterile bag, is making it the ideal complement for the surgeon in the operating room or practitioner who should, for example, remove a corneal FB. Three sizes are available to the attention of the newborn, child and adult, coded by different colours. The blades are full and are adapted to the shape of the globe and eyelids through their curvature, which is more comfortable for the patient. Composed mainly of plastic, the LID-Up is light, biocompatible, and is not magnetisable. If necessary, the width of the blade can be adapted by shape memory to the thickness of the eyelid. The articulation between the arm and the blade of the LID-Up allows a good positioning and avoids hinder the movements of the surgeon. It also allows working “nasal”. In case of local anaesthesia, a locking pin can be inserted, and avoids the inadvertent closure of the eyelids. LID-up small Blade length : Blade width : LID-up large Blade length : Blade width : LID-up extra-large Blade length : Blade width : Design : Locking pin On demand Packaging polygone.ch Photos : Lisa Roehrich 20 pieces + Instruction for use Advantages Ready for use Single use Sterile Full blades with shape memory Possibility to add a locking pin for more security CE CERTIFICATION IN PROGRESS. INTERESTED IN THIS PRODUCT ? CONTACT US.